Canadian pianist Natalie Lo has achieved recognition in her career as a concert pianist from a very young age. She has given concerts as a soloist both in Canada and abroad. She has been highly successful in her early competitive career including First and Top prizes at the Vancouver International Russian Music Festival, the Seattle International Piano Competition, the Canadian Music Competition, the Seattle Young Artists' Music Festival, and the Stravinsky Awards Piano Competition of North America. She has also been a two-time winner of the BC Performing Arts festival. Natalie has been awarded the Youth Arts Award by the BC Arts Council in recognition of her artistic achievements and her contributions to the cultural community. She has also been invited to perform at various showcases and charities, including the Vancouver 2010 Olympics. Natalie made her orchestral debut as a soloist with the Vancouver Symphony Orchestra at the age of 13, and since then has appeared in performance with various orchestras including the Seattle Symphony Orchestra, the Philharmonia Northwest, and the Vancouver Metropolitan Orchestra. Most recently, Natalie performed with the UBC Symphony Orchestra after having won the UBC Concerto Competition. In addition to her solo work, Natalie is involved in chamber music. A highly sought-after collaborative artist, she has received many awards with her chamber groups including the Friends of Chamber Competition, the BC Provincial Performing Arts Festival, and the Vancouver International Russian Music Festival. Natalie will be graduating this May with a Bachelor Degree in Piano Performance at the University of British Columbia under Dr. Corey Hamm. She currently holds a Perfomer's Certificate from the Vancouver Academy of Music and a Performer's ARCT Diploma from the Royal Conservatory of Music studyingunder Lorraine Ambrose. In addition to her studies in piano, Natalie has also achieved top marks in violin exams with the Royal Conservatory, and in yang-qin with the Central Conservatory of Music of China. 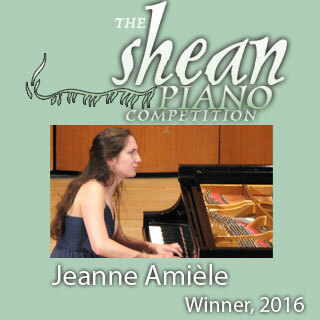 The winner of the Shean Piano Competition 2016 was Jeanne Amièle! Strings Brochures are available on the download page.